Reset trip computer Fiat Grande Punto. From year: 2005, 2006, 2007, 2008, 2009, 2010, 2011, 2012, 2013, 2014. How to reset trip computer Fiat Grande Punto. The “Trip computer” displays information (with ignition key at MAR), relating to the operating status of the car. 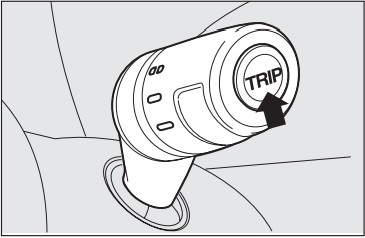 This function comprises two separate and independent trips: “Trip A” and “Trip B” concerning the “complete mission” of the car (journey). Both functions are resettable (reset – start of new mission). Values displayed Fiat Grande Punto. car left parked with engine running for long. Importanta – the variation of the autonomy value can be influenced by different factors: driving style (see what is described in paragraph “Driving style” in the chapter “Start-up and driving”), type of route (highways, urban, mountain, etc…), use conditions of the car (load transported, tire pressure, etc…). What was described previously must be taken in consideration when planning a trip. This value shows the distance covered from the start of the new mission. Average consumption Fiat Grande Punto. This value shows the average consumption from the start of the new mission. Instant consumption Fiat Grande Punto. This value shows instant fuel consumption (this value is updated second by second). If parking the car with engine on, the display will show “—-”. This value shows the car average speed as a function of the overall time elapsed since the start of the new mission. This value shows the time elapsed since the start of the new mission. Lacking information, Trip computer values are displayed with “—-”. When normal operating condition is reset, calculation of different units will restart regularly. Values displayed before the failure will not be reset. Trip button Fiat Grande Punto. short push to display the different values. The reset operation in the presence of the screens concerning the “Trip A” makes it possible to reset only the information associated with this function. The reset operation in the presence of the screens concerning the “Trip B” makes it possible to reset only the information associated with this function. With ignition key at MAR, press and keep button TRIP pressed for over 2 seconds to reset. To quit the Trip function: keep button MENU ESCpressed for over 2 seconds. All information how to reset trip computer is taken from Fiat Grande Punto owners manual. That it is the full procedure how to reset trip computer light Fiat Grande Punto. If you like to reset any maintenance oil light after an oil change. Or reset check engine light, airbag light, inspection key or insp errors when maint reqd, for Toyota cars. Or any warning light for service reminder which appears on the display. Write in the search box the car name for which you want to find information, and find how to reset other service reminders by yourself.